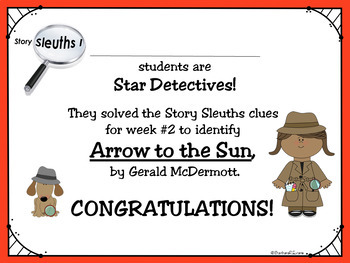 STORY SLEUTHS I is a 4 week, critical thinking project based on Caldecott Award winning books. 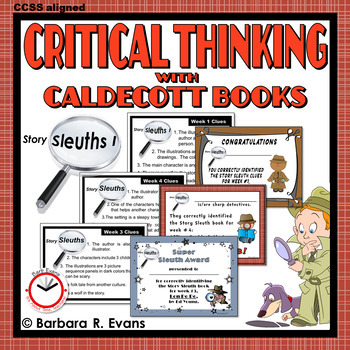 Your students will use text features, illustrations, and context to determine which Caldecott Award winning book is described by the set of clues. By involving your students in this project, you will exercise their deductive reasoning, analysis, evaluation, and problem solving skills. This unit is CCSS aligned. 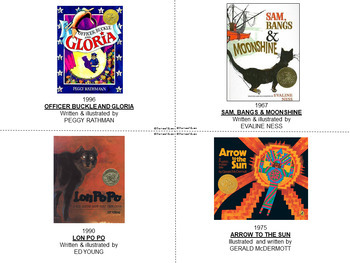 Students also enjoy great literature, learn about artistic media, and participate in collaborative thinking. Designed to be conducted by an enrichment specialist, librarian, or art teacher for whole school enrichment, it can easily be adapted to single classroom use. Originally intended for students in 1st - 3rd grades, I have found that kindergarten and 4th grade classes enjoy it as well. At the end of the week, winning teams are announced and awarded a certificate. 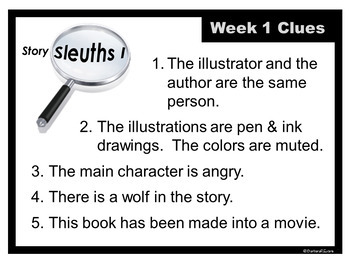 On Monday, a new set of clues is given. Play continues in this way for 4 weeks. The students and teachers at my school are crazy about this project. Yours will be too! ► Be the first to know about my new discounts, freebies and product launches. All new products are 50% off for the first 48 hours. Click here to follow my store. You will now receive customized email updates about my products. ► Get TPT credit to use on future purchases. Please go to your My Purchases page (you may need to login). Beside each purchase you'll see a Provide Feedback button. Simply click it and you will be taken to a page where you can give a quick rating and leave a short comment for the product. Your feedback is important to me. Thank you in advance.